When was the last time you used the word “awesome” to describe a film? 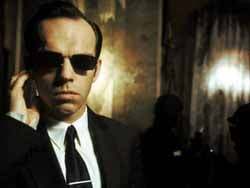 Go back as far as you can remember, and wherever your memory takes you, it may equal the sensation you will have watching The Matrix. No detailed paragraphs or pun-happy blurbs, the only word I want to use is “awesome,” and simply leave it at that. The fifteen-year old in me is running the show now. But you know what? The rest of me is having a blast, too. The immediate draw is the mind-blowing plot. 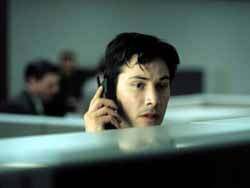 Every day, lonely computer technician Thomas A. Anderson (Keanu Reeves) dreams of a better life. He is not angered by the hand he has been dealt but is curious about what else is out there for him. By night, he goes by the hacker alias Neo, and is guilty of almost every computer crime imaginable. Soon Neo is contacted by an elusive force named Morpheus (Laurence Fishburne), who is considered to be the most dangerous man on the planet. 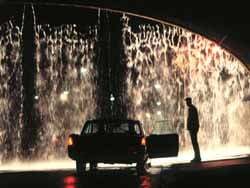 He reveals to Neo that the present-day world is the greatest hoax ever pulled. The year is not 1999 as widely believed, but closer to 2199. The explaination for the hoax is that a cybernetic mainframe known as the “Matrix” has fabricated an artificial world for the remainder of mankind as a way of generating energy for itself. 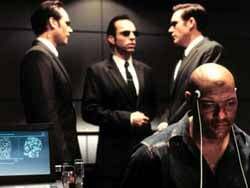 Morpheus then convinces Neo that he is the messiah who will defeat the Matrix and end the enslavement of mankind. Reluctantly, Neo accepts the offer to greatness and begins training to enter the war. The brilliant, “Twilight Zone”-style concept is complimented by the jaw-dropping action sequences and special-effects. Utilizing the technology of a technique known as shooting in “bullet time,” many fight scenes are captured in a detracted, frozen view, where the action stops, but the camera stays in motion, making for some of the most surreal battles ever caught onscreen. Despite always being perceived as having no acting range beyond his surfer-dude character from the Bill & Ted movies, Keanu Reeves is fitting as the somewhat spacey hero. Like many great heroic characters before him, Neo is introduced to a new world and led to his true calling. He is not only revealed something about himself, but his entire view on the world is changed forever. If someone told you that everything you knew was a hoax, you might find yourself a bit a dizzy. Even as the events draw to a close, there is still a hint of amazement in Neo’s eyes. He is matched well with Fishburne’s tranquil Morpheus, who is not about experience but wisdom. He does not teach Neo by taking him through the past, but by preparing him for the future. The duo are as much a teacher and student as they are a pair. This film could very well be the last of its kind: a first-rate, big budget action-adventure with the Warner Bros. label on it. Perhaps The Matrix is a sign of new life for the critically ailing studio, which, for the past few years, has (dis)graced us with such bloated turkeys as Batman & Robin, The Avengers, and Soldier. For every $100 million budget would we be guaranteed a joyless, expensive explosion. The direction represents a new kind of Hollywood confidence. Andy and Larry Wachowski are able to see the future of action film-making with their bold vision. The Matrix may end up feeling like a video game to some. Yet this is not a brainless actioner that leaves your cerebrum pounding like the heavy metal tunes featured in the film. 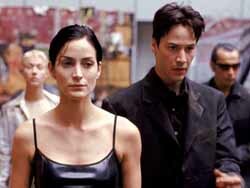 No, The Matrix is quite possibly the greatest video game film ever made without being based on an actual video game. The style is strictly kinetic, but the story is so smart and full of surprises, you may begin to wonder what the “Super Mario Brothers” would have been like if they had used their brains to save the day.